Just outside Cleveland’s city limits lies the section of the Metroparks District known as North Chagrin Reservation. This area is home to a golf course, a wildlife sanctuary, and according to legend, one restless ghost. Even though Squire’s Castle has been abandoned for about a hundred years, it is still haunted to this day. Born in England in 1850, Feargus B. Squire moved to the US with his family when he was 10 years old. Always something of a self-starter, it didn't take long for Squire to start making a name for himself. 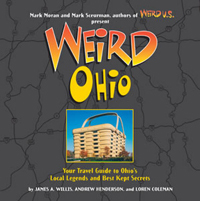 By the 1880s, Squire's big break came when he joined Standard Oil of Ohio as a co-manager. Once onboard, Squire's career took off and he soon became quite successful…and very wealthy. Of all his accomplishments, Squire is most remembered for developing the first oil carrier wagon that allowed for oil to be shipped overland. In the 1890s, Squire began thinking back to the beautiful castles he remembered from his childhood and decided to build one for himself and his family here in the United States. After purchasing a 525-acre plot of land, Squire had plans drawn up for a sprawling estate he called River Farm. Construction on the estate began with the gatehouse, which would eventually come to be known as Squire's Castle. Even though it was to serve only as a gatehouse, the original plans called for an enormous three-story building that included several bedrooms, a living room, a kitchen with a breakfast porch, and even a hunting room and library. Squire spared no expense and the plaster walls were adorned with massive amounts of woodwork and leaded glass windows. Construction on the building went painstakingly slow and while Squire used the building as a summer retreat during its construction, it appears as though he started to lose interest in the idea of living on a country estate. In fact, not only was the gatehouse never completed, but construction on the other parts of the estate never even got underway. After Feargus told his wife about the estate he was planning to build, she began having terrible nightmares about hideous beasts charging out of the woods and killing her and her children. When her family moved out to the estate, living in a gatehouse while the castle was being constructed, the nightmares got even worse, to the point where she was unable to sleep. This began to slowly drive her insane. The longer she went without sleeping, the crazier she got, and the more she believed that monsters and crazed animals were after her. She began a tradition for herself. Every night she took a red lantern and walked around the border of the huge estate. She felt that she was guarding her family from the animals she knew were waiting just beyond the tree line to attack them. This went on for months. Her husband tried to convince her that they were safe, but she was obsessed with the idea that these animals were out there somewhere. Of course, no castle is complete without a ghost, even if in this case, the castle is actually just a gatehouse. The ghost said to haunt Squire's Castle is said to be none other than Mrs. Squire herself. According to popular legend, while the castle was being built, Feargus Squire chose to construct an ornate hunting trophy room in the basement, which he filled with the heads and skins from his hunting trips. The only problem with Squire’s dream house was that his wife not only despised hunting, but also the whole country lifestyle. When her husband first began constructing the manor house, Mrs. Squire would often stay at their home in the city. Eventually, in an effort of appease her husband, she began journeying out to the property. According to the legend, Mrs. Squire’s displeasure over the summer retreat resulted in her developing insomnia. It was said that she often walked the gatehouse at night, carrying a small red lantern for light. Late one evening, for reasons never fully understood, Mrs. Squire ventured alone into the trophy room, carrying her red lantern. While in the room, something frightened Mrs. Squire. Some believe it was simply the reflection of her lantern on the faces of her husband’s trophies. But there are some that believe Mrs. Squire looked into the face of something unearthly that night. Regardless of what it was, she became so frightened that she attempted to flee the room. In the darkness, she fell and broke her neck. Upon finding his wife’s body, Squire was overcome with grief. Indeed, he blamed himself for his wife’s death. He immediately ceased construction on the house, filled in the basement room with concrete, and moved back to the city…never to return again. And after he retired from Standard Oil of Ohio in 1909, he rarely if ever visited the castle. Eventually, in 1922, Squire sold the property. 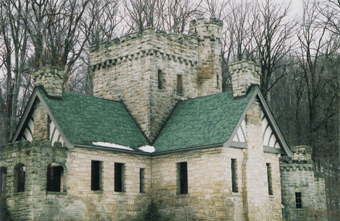 In 1925, the property was purchased by Cleveland Metroparks, who incorporated the Castle into the North Chagrin portion of the Metroparks. Squire died in 1932. 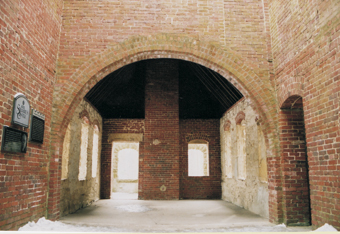 Today, all that remains of the building are the empty rooms which were once the kitchen, great hall, hunting room/library, two small living areas, and a porch. As for the ghost of Squire's Castle, there are some who claim to have seen the light of a red lantern in the windows of Squire Castle. And that the lantern is carried by the lonely ghost of Mrs. Squire, a woman forced to walk the grounds of a place she so despised. People still claim that at night they see a red light slowly moving around the property. It’s said that Mrs. Squire is still walking her nightly walk, that due to her insanity she never moved on, and in fact, she doesn’t even realize she is dead. She still thinks only of the safety of her family, and will protect them against any intruders. It makes for a nice story, but there are flaws to the tale. To begin with, while the basement was indeed filled in with concrete after the park took control of the castle, it was never used as a hunting trophy room. The castle did have such a room, but it wasn't in the basement. But more importantly, Mrs. Squire did NOT die on the property. In fact, she died many miles away under quite normal circumstances. Still, there are far too many people reporting "something" moving around Squire’s Castle late at night. So while the evidence clearly shows Mrs. Squire's spirit is not making her nightly rounds, perhaps some other wayward spirit has chosen to make Squire's Castle its home. After all, what better place for a lonely spirit to take up residence than the remains of an old castle-like structure?